I have been helping a fellow member of Club Scuderia with handling asking price data of UK for sale adverts. During this work I decided to write an algorithm that extracted info from the Pistonheads website from the classifieds ads section – I plan to update this data on a monthly basis and hope to identify trends in the market for this model. As of the 8th August 2013 there were 61 adverts on Pistonheads – 24 Modena, 36 Spider and 1 not stated (in reality this was a Modena but the program can’t view the picture to find out). This table shows the min, max and average prices split by body style. You can see that spiders are commanding a minimum premium of £5,000. Private adverts were a mere 5 vs 56 dealer listings, demonstrating the lack of appetite to buy supercars privately? One thing that surprised me was the data relating to the type of gearbox. The ads were evenly split between Manual and F1, despite the latter being produced in far greater numbers. Another surprise was that manuals are being sold at a significant premium to F1 – perhaps this is a trend to continue as gearbox technology marches on and makes the F1 system seem old? The colour is very difficult to extract as I am looking for keywords appearing in the advert text – vendors frequently rely on the photo to describe the colour and there can also be pollution in the results from interior trim colours. Nevertheless, I have captured quite a few colours and you can see that red is by far the most popular. What is surprising is the strength of Grigio asking prices. 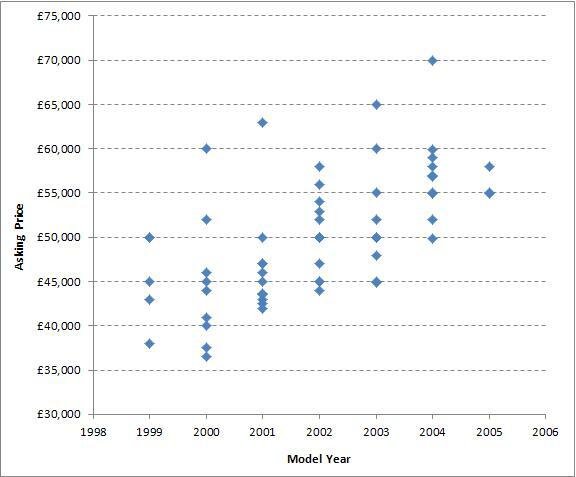 Model year is strongly correlated with asking prices, as you would expect – the younger the car the higher the price. 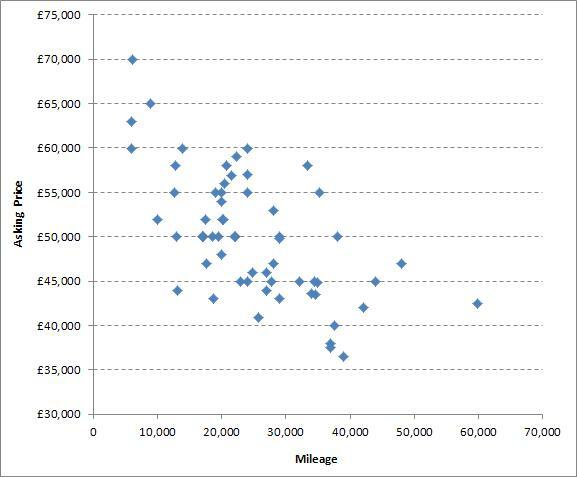 Similarly, low mileage examples are commanding a much higher asking price than those with some action under their belt. The 2013 season has been a very difficult one to judge correctly. The typical tracking data suggests that the first sunny weekend in March starts the season with a bang, that did not happen this year and the general sale pattern has been flat with no peaks and troughs. The export market has stalled completely since Aug 2011 so we are reliant on the UK market base. Contrary to previous expectations of prices being inflated due to previous export market demand, most dealers thought there would be a price drop. This has not happened though, due the low numbers of quality cars available the prices have firmed even more with a divide between premium and useable quality cars getting bigger. Asking prices are not a clear indicators of quality, as an inspector and dealer I can honestly say that finding a good car is becoming an increasingly difficult task. In my view Manual / F1 should be priced the same, I do not see any premium status for the manual stick as the F1 is arguably the better drivers car but the manual is a cheaper car to run on the whole – modern classic gated gearboxes will be those fitted to 308,328, 355, 456, 550. Spider prices in reality are just over that of the Modena and not £5k over as the asking price data suggests. The roof mechanisms are getting old and the running costs are going up which is making the Spider a less attractive car to own. Pending how long the finer weather lasts I would expect prices to drop around November for the first seasonal price change in probably 5 years – this is needed to kick start the market into an active sector again. Once I have gathered some more data samples I will be pleased to share in the underlying info with anyone who wishes to have it. I would also appreciate any suggestions on how to improve the analysis or if you feel I am missing anything critical. I would like to thank Tim Walker for taking the time to impart his vast knowledge of this market for me. His website can be found by following this link where you will find an excellent buying guide. Aldous, very interesting post. I wanted to share with you a new service that I am launching here in the US called “PriceHub” (www.pricehub.com) in case it is helpful to your analysis. In short, we are starting a company that provides market price transparency on used cars by publishing the actual transaction prices of vehicles sold. We pull data from various sources – including DMVs, retailers, auctions, etc. We just launched the company, so our product is up but rudimentary (our official ver 1 is slated to come out at the end of the year) but the data is real and we are working every day to refresh and continually load more records as we get them. So far, we have 5 million records. Under the Ferrari tab, you’ll find about ~140 sold transactions for 360s that could be good input for your pricing model. Do have a whirl at our service and share with others if you feel it’s useful. And of course, would very much appreciate any feedback you might have on the product. Your website looks to have some very good data in it – being able to see actual transaction prices should help many people who are looking to buy in the US. Sadly, I can’t assimilate similar data over here hence why I am looking at asking prices.